Soraya Sarah Nazarian is an Iranian-born artist. She is a master in direct stone carving. Her work explores themes of motherhood, family, spirituality and Iranian culture. Soraya immigrated to the U.S. in 1979 with her family. Early in her career, she worked in multiple mediums including drawing and clay. In the 1980s, Soraya began sculpting at American Jewish University, and established her own studio soon after. Early experimentations show Soraya’s depth in mastering the female form and in creating abstract compositions out of stone. These early works often reflected her life experiences - a theme that reemerges throughout her career. Most of her works are based on strong familial connections and a commitment to humanistic values. In 2000, Soraya traveled to Pietrasanta, Italy, a city made famous for its marble quarries by the Renaissance sculptor Michelangelo. 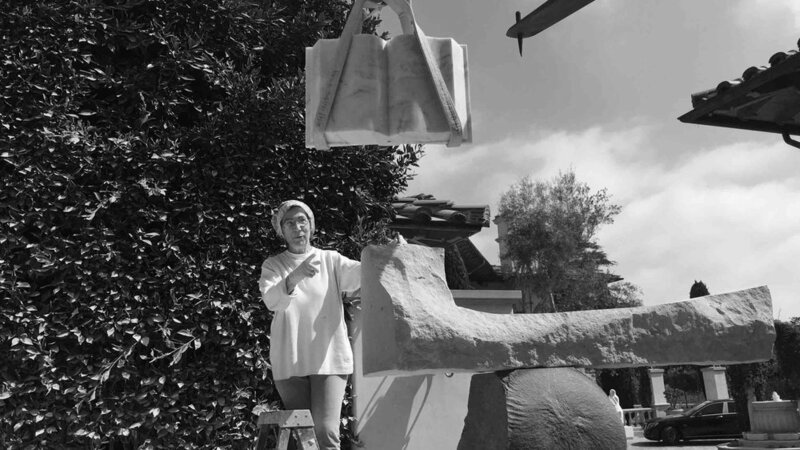 The experience profoundly shaped her life, focused her technique, and enhanced her relationship with stone. Since her initial arrival, she has been one of the few women who have personally selected stone from Pietrasanta quarries. Soraya’s work has been highlighted in various solo and group exhibitions. Strength Revealed (2010), was a 25 year retrospective of her work curated by Barbara Gilbert, curator emeritus of the Skirball Cultural Center and Museum in Los Angeles, CA. Accompanying the show was a catalogue titled Strength Revealed: The Sculpture of Soraya Sarah Nazarian including essays by Ruth Weisberg, Cynthia Burlingham, and an interview with Gloria Gerace. Recent group exhibitions include My Heart Is in the East (2012) an official satellite show of the Fowler Museum's Light and Shadows at Shulamit Nazarian gallery Venice, CA; Sacred Words, Sacred Texts (2013) at Hebrew Union College, Los Angeles, CA; and 7,657mi exhibition in conjunction with the Jerusalem Biennale (2015) at American Jewish University’s Platt Gallery, Los Angeles, CA and Jerusalem, Israel. Her work is held in numerous private collections. Cultural, educational, and medical institutions in Israel and the U.S have commissioned several large-scale public art sculptures. Major commissions include Sound (2002) at the Jerusalem Academy of Music & Dance in Jerusalem, Israel; Reflections (2007) at Sapir College, near Sderot, Israel; Legacy (2009) at the University of Haifa in Haifa, Israel; Identity (2010) at Saperstein Middle School in Los Angeles, CA; Wings (2014) at The Hebrew University of Jerusalem in Jerusalem, Israel; Love Heals (2017) at Rambam Hospital in Haifa, Israel; and Unbound (2018) at California State University, Northridge. Alongside her many artistic accomplishments, Soraya has also been a lifelong patron of the arts and a strong supporter of humanitarian, academic, and cultural institutions. She is a founding trustee of the Y & S Nazarian Family Foundation and the Ima Foundation. The principles that inform Soraya’s philanthropy and which guide the Foundations envision the promotion of education as the most important catalyst for societal change. The Foundations support educational causes in a broad spectrum of institutions and through a wide variety of avenues - academic, public policy, community based social and artistic programs. Giving back to Jewish and Iranian causes are also central to Soraya’s vision of honoring the roots of her family and community.